I am sure that many readers have seen this floating around the internet. 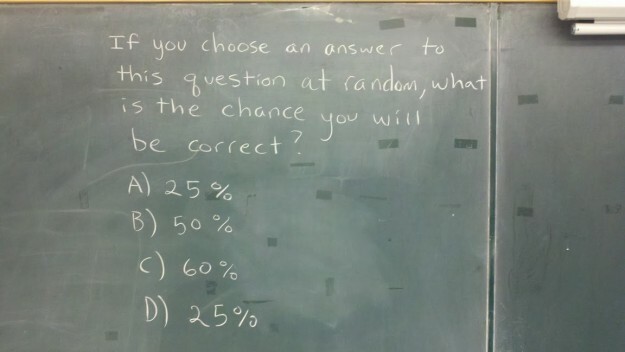 I am not great at math; I’m not intuitive at it and hate trick questions most of all, because they are … tricky. On the other hand, ever since realizing when I started law school that in my life I couldn’t avoid – what, exactly? – well, the basic math required to do the first year of a standard MBA, I have forced myself to grapple with math with my limited math intuition. I work problems, learn the formulas, do online courses that force me to do problem sets to keep basic skills in things like statistics. I’m saying all this as a suggestion to people like me who, unlike apparently the vast majority of VC commenters, are not particularly good at math but need it at some level. The problem for folks like me, who need it, even like it, but are not great at it, is that there’s always a higher level. The key for most people, for people like me, as with most technical subjects that are not directly your day job but still important, is to figure out where to perch yourself. There’s no point in my trying to turn myself into a scientist, engineer, economist, or CS person. What this means is that I do best when it’s fairly routine, and I’m working within a particular topic – what I hate and what I’m sure most people like me hate, are tricky word problems that might draw on something completely outside how I understand the problem. The sort of intuitive leap that I am really good at in some things, but not in this. Put another way, if it’s the sort of problem that The Chief Conspirator loves, it’s probably my worst nightmare. That said, I assumed that this was one of those fiendishly counterintuitive problems that sometimes confuse even sophisticated technical folks. But even after consulting one of my pop sci books on games with statistics, it didn’t seem to fit. I won’t embarrass myself by trying to explain how I thought about it; I did start by asking, suppose there were only one choice, what? Suppose there are two choices, what? But this approach didn’t seem to quite answer the question. I’m now not sure if the question is ambiguous in some way, or whether I’m simply missing, as ever, the intuitive leap. It’s bugging me, though, and I Won’t Rest Until You All Have Answered It.